c) Min. 2 years of relevant work experience preferably in IT/e-Governance/ IT related project co-ordination and program management in related fields. d) Should be resident of Chirang district. Age: 24 to 35 as on 01-01-2015. 3. 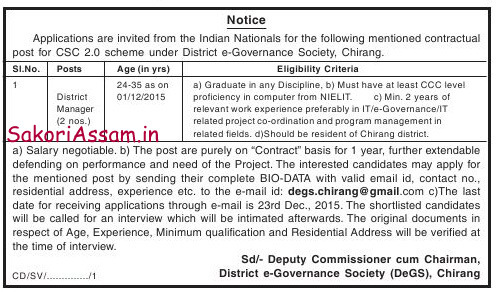 The last date for receiving application through e-mail is 23rd Dec., 2015. The shortlisted candidates will be called for an interview which will be intimated afterwards. The original documents in respect of Age, Experience, Minimum qualification and Residential Address will be verified at the time of interview.